Well, it has come out! 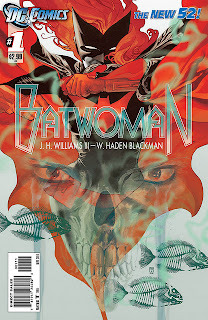 I have been waiting for this comic for a year, and my appetite was completely whetted by BATWOMAN #0, a story that would serve as a primer for Batwoman, getting everyone to catch up on her adventures in the DETECTIVE COMICS run written by Greg Rucka, and also preparing everyone for the art by J.H. Williams III and Amy Reeder. The series, following the adventures of Kate Kane as Batwoman, successfully managed to be marketed successfully with enough hype without resorting to the cheap and obvious marketing tactic of capitalizing on Batwoman being a lesbian. Even without resorting to such an obvious marketing ploy (*ahemARCHIEahem*), BATWOMAN #0 was the 27th best-selling comic of November 2010. The first issue was supposed to hit in February 2011, but you know, big marketing and corporate moves happened, and they decided to push this book back to September 2011 to go with the DCnU "new 52" campaign. So after multiple delays and creative team shifts, BATWOMAN #1 is finally out. How is it? Was it worth the wait? Will it go over well with new readers? There's no way for me to do this review without any SPOILERS, however minor they are, so the rest of it is after the jump. You've been warned! How is BATWOMAN #1? Well, that's an excellent question. So let's break it down. Getting the blatantly obvious out of the way first, the art is gorgeous. That was the entire selling point of the series, after all — that beyond the obvious promises of a gripping narrative and enjoyable characters, we would be treated to a visual feast. Don't take my word for it, though; just check out the preview pages at Williams' website. He's back to his usual tricks. In addition to design-oriented double-page spreads, he is also changing and mixing styles, using a flatter style with thicker inks for the civilian scenes, a more realistic style with more 3-dimensional tones for Batwoman herself, as well as for Batman — the effect is to make us feel as if being Batwoman places her in a different world or level of being than being regular old Kate Kane, a level that only Batman (thus far) can match. The colors by Dave Stewart are also outstanding, as he knows just the right amount of depth to apply to each object on the page. All right, you didn't actually need me to say any of that, so let's get to the question that's probably on your mind, which is, "How was the story?" Well, to be honest, you can tell that Williams and Blackman are still finding their footing as comics writers. The pacing is a little off — some scenes go faster than it seems they're supposed to, most notably in the second half of the issue, when the transitions between scenes seem kind of clunky. The first half, however, is very well-done and well-paced, and indicative of the kind of scribing potential that Williams and Blackman are capable of achieving. There's a scene where Kate visits the police station to see Detective Maggie Sawyer, and Kate sees a picture of her ex, Renee Montoya. This accomplishes so many things at once: establishes a history between Kate and Renee, a connection between Kate and Maggie, and a very human and relatable side to Batwoman. The use of Maggie Sawyer is great here for me, because I was always a fan of her in the Superman books in the late 80s to 90s, as well as of her character in the Superman animated series (which establishes her sexuality, albeit subtly — it's there, if you can't believe it). However, her introduction in this series is done in such a way that a new reader wouldn't be alienated at all. It doesn't even so much as reference Kate and Maggie's previous (and first) meeting, and any new reader would easily figure out Maggie's personality, character, and role in the series. The same thing holds true for two of the other guest stars in the book, and while new readers would have no trouble figuring those characters out, Williams fans in particular will be very happy with the fact that (SPOILERS SPOILERS SPOILERS) Cameron Chase, the title character of the comic where Williams first started getting noticed, is back, just in time to coincide with the release of her series' being put out on TPB for the first time ever at the end of the year. A meeting between Chase and Batwoman is in the offing, and with two strong, female characters, this proves to be a very promising meeting that I just cannot wait for. Some minor gripes though. I can't really say the actual mystery that drives the story is all that intriguing. Basically, drowned kids have been turning up, and the only lead the police have is a ghost story. 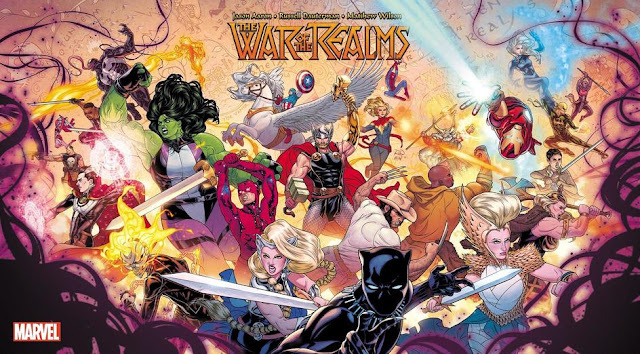 This may be developed in future issues, but because this is the first issue of a new series right in the middle of a heavily marketed linewide relaunch, I consider that to not be good enough. A new reader should be wowed and intrigued immediately. I also don't understand the development with Bette Kane, Kate's cousin, the superheroine now formerly known as Flamebird. Kate strips her of her costume and her superhero identity and replaces it with something with less appeal in both visuals and concept. Again, that may be leading to something, but that's not the stuff that should be there in a first issue. There's also a two-page scene with Kate's dad that kind of explains what happened in the previous Batwoman story, which is exactly what should be done in a first issue, but I can't help but feel that it makes the zero issue irrelevant. But those gripes are minor, and could easily be explained by the fact that this issue was done well before the reboot was even announced and the launch was moved to September. In conclusion, this is still going to be the best-looking series of 2011. If the pace fixes itself and picks up, and I have no doubt that it will, because a lot of elements look like they're going to be coming together this early on, this will easily be one of the top 5 best books on the market, and still the one from the DCnU that I look forward to the most..
You know what? Writing this review makes me want to read the run Batwoman had in DETECTIVE COMICS. I think I shall, right now, to tide me over until the next issue comes out. How mucha i missed JH willians!! !